It’s the beginning of the year so it’s goal setting season again, and a lot of you are making resolutions for the year ahead. Many of you will be setting deadlines on your goals, and you may be tempted to create arbitrary ones—using a random date—just to add focus. However, in my classes and in my books I discuss problems with using arbitrary deadlines. Here’s how to fix them so your deadlines really work! Why Set an Arbitrary Deadline? An arbitrary deadline is a deadline date that you make up out of thin air. The specific date for the task is not driven by any event, stakeholder dependency, or other materially constrained timeframe. In other words, there is no real pain (or missed opportunity) that will occur at the moment you pass that exact date. And that’s the problem—they are easy to ignore or keep pushing out. One reason many of us use arbitrary deadlines is because older time management training encouraged it. The older systems stated “you should put a due date on everything or won’t get done.” As a result, since most tasks don’t have a hard date, we just make one up. However, I assert that using arbitrary deadlines is usually wrong. Why? Because when the date arrives you’ll know—you’ll recall—that it’s arbitrary. And then you’ll likely skip it. That’s because in a busy work environment there is nearly always some other fire drill going on that requires more attention. Think about it. If you’ve got a client screaming for attention, and at that moment a task to clean your desk drawers pops up, which are you going to pay attention to? The guilt factor doesn’t work here, and you’ll be skipping a lot of these arbitrary deadlines. Then, when you skip a lot of deadlines, you will start to lose respect for all the deadlines you set, and then you really will miss something important. So don’t call “wolf” unless the wolf is really at the door. In other words, only use deadlines when the date set is material. Instead of putting random deadlines on all tasks, I am a big believer in using business intuition to navigate through the rapidly changing business environments we work in these days. As the urgency and utility of various business activities ebb and flow throughout your work days, weeks, and months, you’ll see when things make sense to do; you’ll also see when skipping previously committed tasks is the right thing to do. I encourage you to use that more, and the 1MTD and MYN systems help you do that—so put one of those two systems in place if you have not yet. When Are Deadlines Truly Needed? But sometimes deadlines are truly needed. How do you know when that’s true? When other stakeholders are depending on a delivery date. I once worked for a large insurance company in the role of coordinating projects across the entire organization. Many projects were dependent on the deliverables from other projects. Often Team B needed a work product from Team A to get started; a lot of money and forward momentum would be lost if Team A missed their deadline. 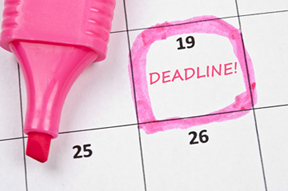 Clearly, setting and meeting deadlines can be critical if others are depending on your date. When Pride or Self-Image is at Stake. Most of our smaller tasks, however, do not affect others—others are not waiting on us. In those cases though, our pride or self-image can be hurt if an important task lingers uncompleted too long. If that happens repeatedly on a given task, setting a deadline can be the only useful way to emphasize our own internal commitment. This is tricky, however, because we may rationalize that it is okay to push the deadline off over and over again, since there is no immediate impact or “pain” if we delay just a while. But those delays can add up, which leads to the next point. If you must set an arbitrary deadline, then a sting/reward system like beeminder.com can be used to remove the deadline’s arbitrary nature. Such a system does this by automatically triggering a fine if a self-imposed milestone is missed—your credit card is hit. This works best for longer goals that have frequent intermediate milestones, like losing X pounds per month, or making Y sales calls per week. That’s because the occasional “sting” (or warning of one about to hit) can get you back on track. So use deadlines sparingly and wisely. Set them only when you can make them real, using the guidelines above, and otherwise use your business intuition to decide when to work on tasks that don’t have true deadlines. In fact, when using the urgency zones approach in the MYN and 1MTD task systems, you’ll need to set arbitrary deadlines much less often. I find that only about 1 out of 10, or 1 out of 15 of my tasks need hard deadlines. The systems allow me to identify needs and opportunities that make sense for today without using guilt-based arbitrary deadlines that usually don’t work. But what if one’s boss insists on deadlines?